35 yo male with progressive spondylolisthesis. - Matthew D. Hepler, M.D. 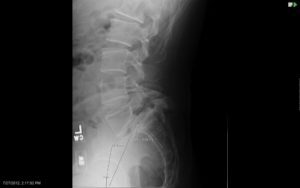 35 yo male with progressive spondylolisthesis. 35 yo male with progressive spondylolisthesis and chronic disabling back and leg pain, and mild foot drop despite non operative treatment including epidural steroid injections and physical therapy. 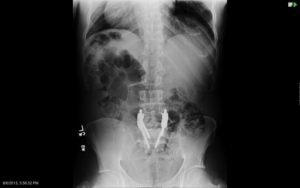 Preoperative xrays demonstrate a grade III/IV spondylolisthesis and severe stenosis on MRI. 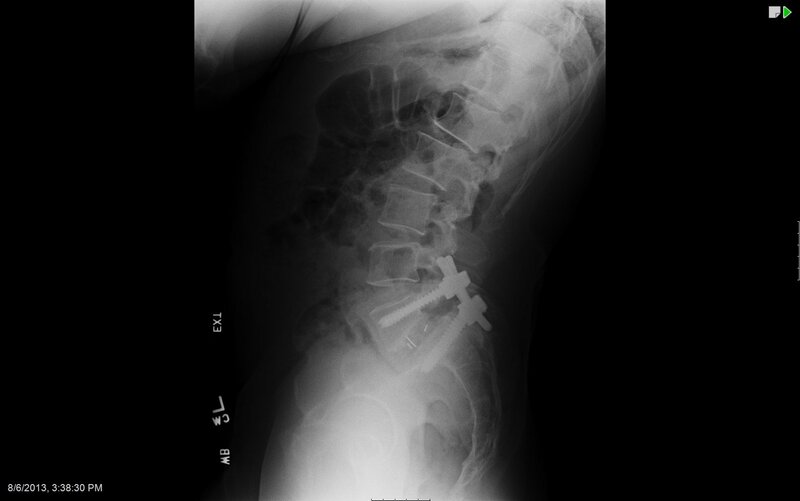 The patient was treated with posterior decompression and release through a PLIF approach, spondylolisthesis reduction with pedicle screw construct L4-S1, and cantilever reduction and compression to restore lordosis. The provisional instrumentation at L4 was then removed allowing fusion of only the L5/S1 segment. Postop xrays demonstrate reduction of spondylolisthesis and restoration of sagittal alignment with clinical resolution of back pain, leg pain, and foot weakness.